Skip the crowds, lines and bad attitudes and travel to Europe during the winter months instead. There are plenty of fun things to do and see for kids of all ages. 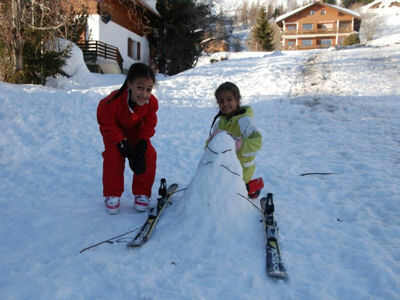 Here some of my favorite family-friendly winter activities in Europe. Winter Sports – Europe is the perfect place to enjoy winter sports, with mountains of snow from the Alps to the Dolomites. Skiers of all levels can enjoy perfectly manicured ski routes at resorts in France, Switzerland, Italy and Austria. Not a skier? Grab your toboggan and zoom down Europe’s longest sledding run. The 10 mile long run is located near the Swiss town of Grindelwald, but Harry Potter fans be warned, it’s nowhere near Hogwarts. Or lace up your ice skates and take a spin around the outdoor ice rinks you’ll find in some of Europe’s coolest capitals like the Rathaus (city hall) in Vienna, Somerset House in London, the Eiffel Tower in Paris, Berlin’s Potsdamer Platz or Museumplein in Amsterdam. Performing Arts – The winter months present the perfect opportunity to attend a ballet, opera or theater performance in one of Europe’s culture capitals. Experience this grand European tradition by seeing a performance by the Paris Opera Ballet or an opera at the Vienna Opera House. Museums – Ducking inside a museum on a cold winter’s day will provide both warmth and an education. Natural history and military museums like London’s Royal Artillery Museum, museums dedicated to science like Paris’ Cite des Sciences et de l’Industrie or specifically aimed toward children like the CORPUS near Amsterdam are great family-friendly choices. Castles – The castles in Europe are the stuff that make dreams and fairytales come alive for kids. Visit Neuschwanstein, Germany’s most famous castle (the inspiration for Sleeping Beauty’s castle at Disneyland), the Tower of London, home of the Crown Jewels and the Beefeaters who protect them, and the world’s largest castle complex, Prague Castle. Amusement Parks – Not all amusement parks in Europe hibernate for the winter. For some, that’s when the fun begins. Have Olympic style fun at Hunderfossen Winterpark in Lillehammer, Norway, home of the 1994 Winter Olympics. Enjoy winter at The Netherlands’ Efteling Amusement Park with sleigh rides, ice-skating and a snow slide and what could be more heartwarming than the parades and live stage shows at Mickey’s Winter Wonderland at Disneyland Paris? Winter Food – Be sure to indulge in the hearty winter fare of whichever European region you visit. Erwtensoep, the pea soup from the Netherlands made with slices of rookworst (smoked sausage), Fondue, the Swiss/French favorite, Swedish meatballs or if you’re feeling brave, the Scottish delight, haggis. A shot of Scandinavian Schnapps or Russian Vodka for parents, and for kids, the perennial favorite, hot chocolate, will undoubtedly warm your insides as well.